Originally named Duguay-Trouin after René Trouin, Sieur du Gué who was a famous Breton corsair of Saint-Malo. He had a brilliant privateering and naval career and eventually became "Lieutenant-General of the Naval Armies of the King." 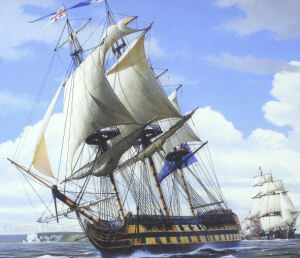 HMS Implacable was a 74-gun third-rate ship of the line of the Royal Navy. She was originally the French Navy's Téméraire-class ship of the line Duguay-Trouin, launched in 1800. She survived the Battle of Trafalgar only for the British to capture her at the subsequent Battle of Cape Ortegal.